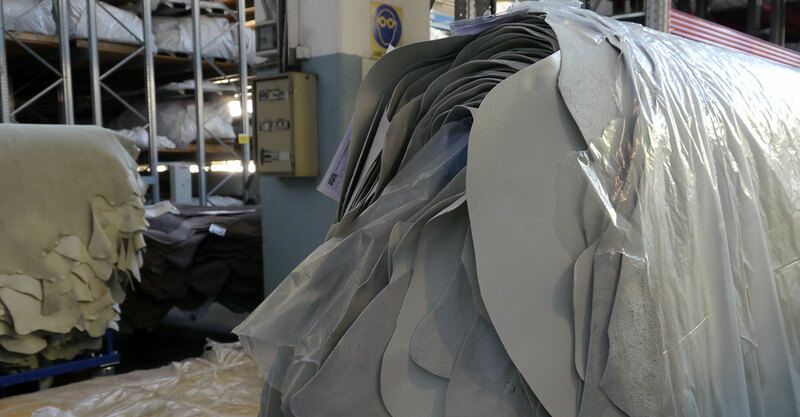 Italy is home to more than 300 upholstery and fashion leather tanneries. 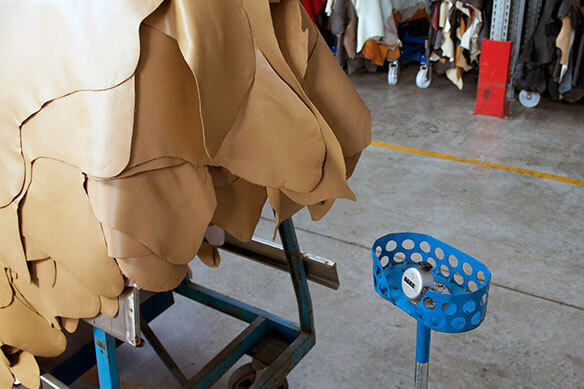 The northern Italian tanneries in Arzignano produce upholstery leathers while Santa Croce is known for fashion leathers. 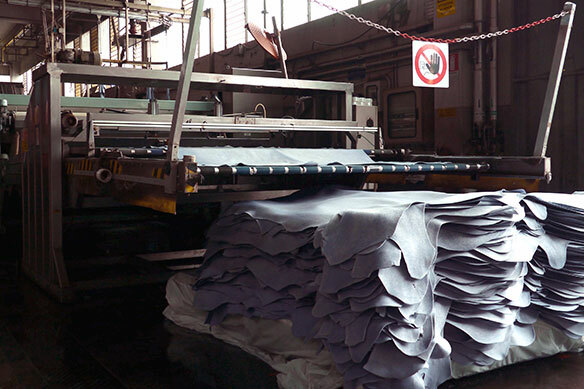 Spinneybeck’s full grain leathers are produced at an Arzignano tannery. 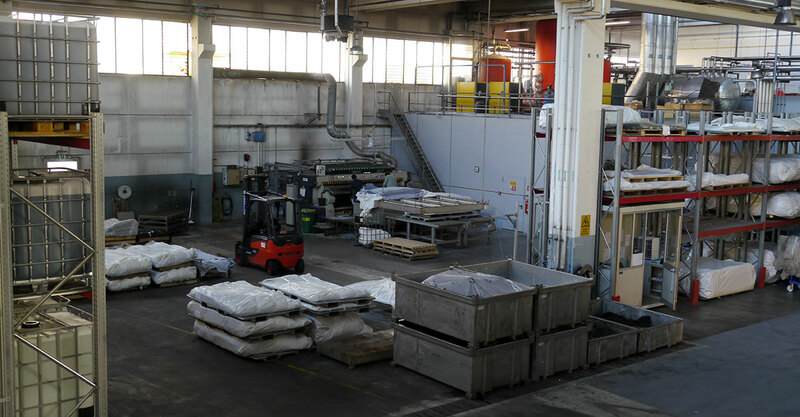 Modern tanneries are clean and safe with large amounts of natural light. 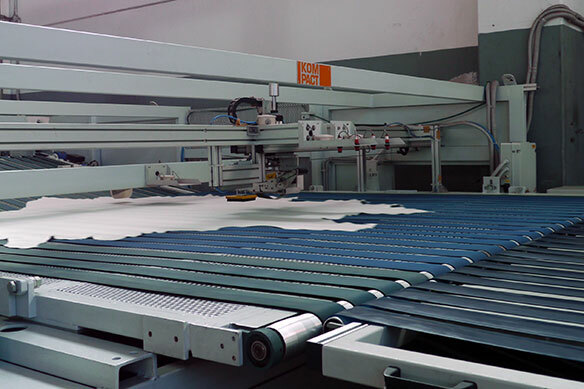 Automation has made the process faster, more efficient, and has enabled increased quality control. 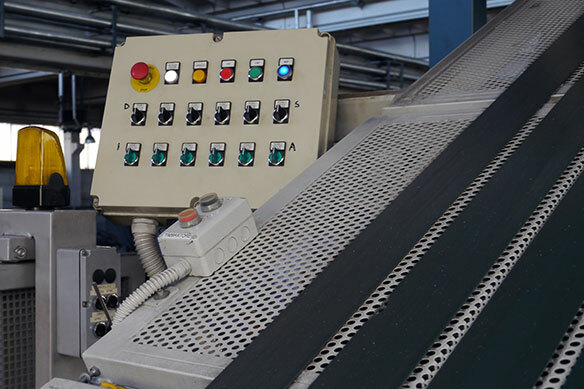 The leather manufacturing process is a series of six phases that begins with raw material preparation and ends with final inspection and shipment. Europe’s moderate climate and stringent standards in the beef industry ensure ideal conditions for the raw material of leather. Leather is a by-product of the meat industry and hides that would otherwise go to waste are processed into a useful, long-lasting product. 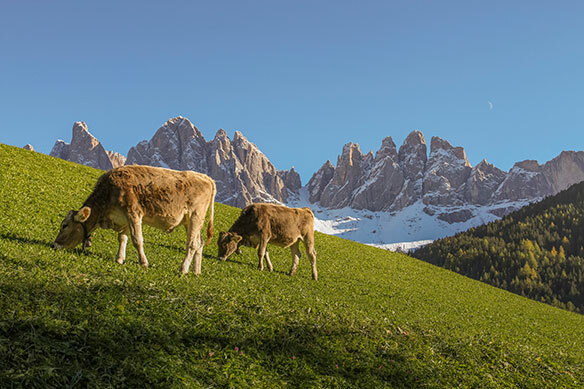 Raw material obtained from Italy, Southern Germany, and Denmark benefit from a moderate climate where containment and management methods do not cause visible injury to the cattle. In contrast, cattle in other areas may be raised in extreme temperatures and are subject to barbed wire fences, branding, and electric cattle prods which mar the hides. In addition, the use of grain feeding and growth hormones can negatively impact the hide quality. A good hide has an 80–90 percent hide yield whereas the yield of a bad hide is reduced to avoid holes, insect bites and other blemishes producing only a 60 percent hide yield. Hides arrive at the tannery and are stored in a Beam House. They are packed in rock salt for preservation, folded, and stored on pallets for up to 30 days. When ready to be processed, desalting removes salt from the hides by tumbling and propelling the hides forward with a series of pegs. The salt is collected and recycled for additional hide preservation in the Beam House. Haired hides are not desalted but are placed in soaking drums for one to two days to rehydrate and remove dirt, salt, and some soluble proteins. Hides are treated at the same time with lime to remove the hair and to soften and enhance the hide. Next, all hides are defleshed to remove surplus waste from the backside of the hides. At this point, hides have a significant amount of moisture content and are approximately 4 mm thick. The hides pass through the splitting machine and are sliced into two layers. The bottom portion of the hide (termed the reticular segment or split) is used for inexpensive, inferior leathers. Often, these splits are sold to the handbag and shoe industry as well as to tanneries that specialize in production grade, top grain, and split leathers. The upper portion of the hide (termed the papillary segment or dermis) is utilized for high quality full grain leathers. The fiber structure is the tightest at the uppermost layer of the hide allowing specialized retannage, a luxurious suppleness of hand, a full rich base dye, color clarity, and a breathable protective finish. Primary tanning converts pre-tanned hides into leather by preserving and halting the decomposition of the hide. Hides are loaded into a tanning drum along with a solution of chromium salts or vegetable tanning agents and rotated up to eight hours. The salts and tanning agents preserve the leather as well as soften it. This highly sophisticated piece of equipment continuously reheats the tanning solution, providing the best possible penetration of the hides. Next, fat liquoring adds natural bovine oils imparting strength and softness to leather. There are three types of tannage. Vegetable tannage is the conversion of rawhide into leather with vegetable tanning agents. This process produces leather with greater body and firmness than the more general method of chromium tanning. The most commonly used vegetable materials are mimosa, chestnut, and bark. Chromium tannage is a synthetic tannage. Leather tanned with chromium salts provides a soft, mellow suppleness of hand. Combination tannage is a combination of chromium and vegetable tanning together resulting in a full bodied, soft and supple leather. 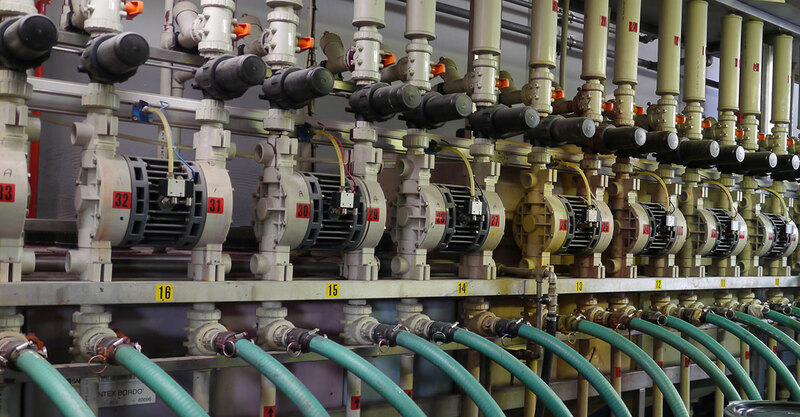 Tanneries in the United States and Europe are required to process and treat the water used in tanning so that it is completely filtered and purified. Any chromium used in tanning is extracted and formed into nontoxic bricks for disposal in landfills. Its important to note that the Chromium 3 used in leather production is not the carcinogenic Chromium 6. After tanning and fat liquoring, hides are placed in a sammying machine. Sammying is the removal of excess moisture from a hide through pressure applied by rollers. Next, an operator inspects and rates the quality of each hide. 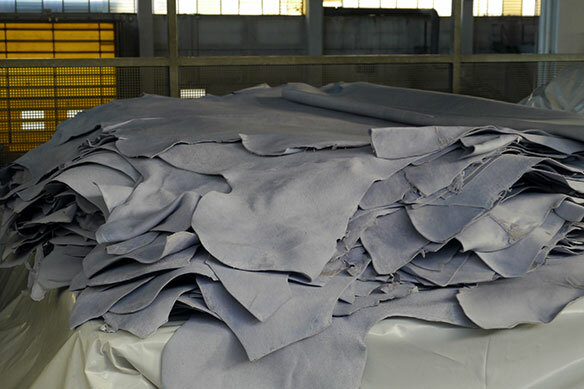 The hides are graded according to the quantity and locations of natural features and flaws including bug bites and other imperfections that could impact the overall quality of the hide. Hides are graded by number with one being the highest quality and three being the lowest. These grades determine the types of leather to be produced from each hide. For example, aniline and nubuck leathers require the best quality hides. Heavily coated or embossed leather may use a lesser quality. The hides are sorted by grade and wrapped in plastic to keep them from drying out. At this stage, chromium tanned hides are known as “wet-blue” because of their pale blue color. The hides still have irregular, ragged edges, which are trimmed off before the hides are shaved. All of the trimmings are collected in bins. The hides are then shaved to provide a specific, uniform thickness determined by the quality of the final leather product. After shaving, the hides are measured to confirm the exact thickness. These shavings are collected and sent to be made into bonded leather, recycled leather, floor tile backing, belts, and other products. Retanning is then completed to modify the physical characteristics of the leather to suit its final use. Leather is retanned with chromium salts, vegetable matter, or a combination of the two, giving a unique hand or texture. Hides are then placed in a sammying machine for a second time to remove excess moisture. The hides are sorted and stored once again. Next, hides are vacuum dried, oven dried, or air-dried. With vacuum drying, hides are placed on a flat, temperature controlled surface and a top is lowered over them to create a vacuum. This vacuum allows the water to be quickly extracted, creating a tight smooth grain texture. Leather that goes through vacuum drying will shrink approximately five percent during this process. 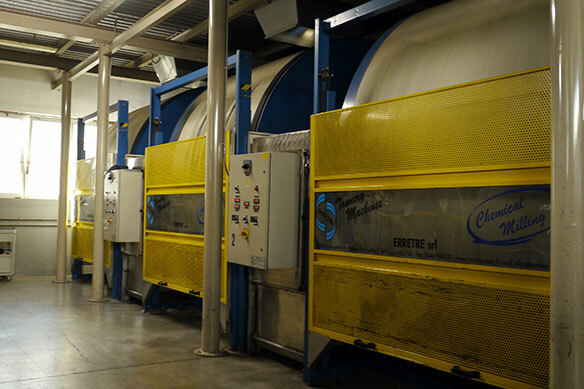 If the air-drying method is used, hides are hung on an overhead conveyor moving throughout the tannery until they are completely dry. Mechanical softening in the staking machine massages the hides so they become soft and supple. Hides are draped over horses after staking and after hides are dried, they create a “crust.” The bleaching agent used in retannage gives a good base from which to begin dyeing and allows for excellent clarity and color uniformity. Dyeing adds color to the leather. Tanneries are equipped with an assortment of dyes to color leather in a variety of neutrals to bright, saturated hues. The recipe for dyeing is formulated by computer to ensure color accuracy and consistency. Dyeing leather is a lengthy process. Hides are put into the dye drums and after eight hours, a cutting is taken to assure that 100 percent of the dye has saturated the hides. The remaining liquid in the dye drums will be clear and hides are either air or vacuum dried. Spinneybeck’s high quality dyes allow a greater saturation and dye enrichment than ordinary upholstery leathers. Hides are staked for softness after drying and vaporized to re-moisturize. The purpose of finishing is to minimize the appearance of grain blemishes, give the required degree of gloss, ensure softness and malleability, and provide a more protective and cleanable surface. During the milling process, hides are tumbled in climate and humidity controlled drums, to soften the leather. Hides are toggled onto stainless steel mesh frames for four to eight hours to stretch and tighten the fiber structure. Leathers produced from finer raw material receive a minimal application of surface finish or pigment, allowing it to remain porous and breathable. High quality finishes permeate thru each hide. Naked leathers and haired hides skip the finishing stage. Hides are toggled onto stainless steel mesh frames for four to eight hours to stretch and tighten the pore structure. They move through the spray line for finishing and into an oven for curing. Hides are then stacked on horses after finishing. Mother of pearl can be added to the finish to create pearlized leather. Other technical processes, such as embossing, enhancing a grain pattern or texture on leather also take place at this time. Most full grain leathers skip this stage and go directly to ironing. The ironing process uses heat and pressure to create varying degrees of sheen. By applying more pressure at higher temperatures, a greater sheen can be achieved. Hides are draped over horses to prevent wrinkles and creases that might occur with folding. The final steps are to inspect and ship. A variety of tests are done to ensure high quality control. These tests include color, abrasion, fading, and dimensional stability. Once a hide has been tested, it is inspected to ensure it meets all of the intended quality specifications. Hides are then measured and stamped with the total area in square feet or square meters. The hides are rolled on tubes (finished side in) or draped on a horse to prevent any wrinkles or folds when shipping.